NEW YORK – I have come to three ‘Spring Training’ marches now—but today [April 20th] was by far the most exciting. The weekly marches on Wall Street have become increasingly well-organized and effective at getting occupiers in front of the stock exchange for the closing bell every Friday. The marches are designed as a fun way to practice new protest tactics before May Day. The police stop us blocks away from Wall Street when we march in a group, so we have developed different tactics of going “civilian,” breaking into small groups to penetrate the police lines that circle the stock exchange before reforming the protest on the other side. This week, when we began to arrive, there were many occupiers already there who have been occupying the steps to Federal Hall since they got pushed off of Wall Street earlier this week. The police had barricaded the steps and control access to what they officially refer to as the “first amendment rights area.” Seriously, they really call it that. In addition to the NYPD, there were counter terrorism, federal park police and SWAT. As the crowd swelled the police began making arrests and clearing the sidewalk. The police pushed aggressively and isolated everyone who had just arrived from the group that had been occupying the steps to Federal Hall, arresting at least three. Tension was high, but the crowd calmed before the people’s gong—our response to the closing bell of the stock exchange. We mic checked to the people behind police lines on the barricaded steps and celebrated together before breaking into the familiar chant, “A – Anti – Anti-Capitialista,” this time in the very heart of capital. There were police barricades and lines of officers keeping us apart, but there were a few hundred of us dancing right across from one of the most potent symbols of power; the energy was high. A mic check broke our chant. Two weeks ago a group began sleeping on the sidewalk, following the exact specifications for legally sleeping on the sidewalk as a form of protest from the the 2000 U.S. district court decision Metropolitan Council V. Safir. The occupation grew larger each night until last week, when the police started arresting people. The occupation shifted half a block to Federal Hall, which as federal property was beyond the jurisdiction of the NYPD. This was where the “first amendment rights area” had been set up. Direct Action had video cameras in place to film the occupiers laying down in accordance with the law, then immediately getting arrested for it. It was powerful. The NYPD has tried very hard to prevent us from growing roots anywhere in the city. The last few weeks have been filled with arbitrary arrests, sleepless nights and scant media coverage, but for the first time in a while, it felt like the tide was turning today; it felt like we were winning. Editor’s note: This is part of series of stories detailing how different occupies are getting ready for May Day. Read what other’s are up to and tell us what’s happening where you are. PORTLAND, OR–If you were watching at least one or two news stations last night, and if you’ve read the Oregonian‘s website this morning, you might have heard about an aborted attempt to “reoccupy” Chapman Square—the heart of last fall’s Occupy Portland encampment. The occupation was impromptu, led by one occupier, Remi, who put the call out on social media for reinforcements in hopes of making a stand on First Amendment issues. He brought a sign, his molecular biology textbook, and a backpack. The idea was interesting: Occupy and break park curfew hours without camping—a protest, not a party, etc. Whether and how to reoccupy isn’t yet a clearcut issue for Occupy. Editor’s Note: This story is excerpted from the Portland Mercury; you may continue reading here. Editor’s Note: A version of this story originally appeared at the Portland Occupier. Today it was my privilege to sit down with Rose and Pam Hogeweide at Anna Bananas in North Portland to discuss Rose’s arrest on the morning of Occupy Portland’s eviction. They are a dynamic and strong mother and daughter that I first met after seeing proud mother Pam’s Twitter posts announcing Rose’s first court date on December 13. They have been involved in Occupy Portland actions since October 6 and recently celebrated Rose’s 18th birthday in very Portland-like fashion with a tattoo that matches her mother’s. I briefly visited with the family prior to court and we’ve kept in touch in social media circles. As was the case in many Occupy related arrests, Rose’s charges were dropped. By her account, this left Rose feeling very discouraged and ultimately dismissed, in the same way that she felt the entire Occupy movement was dismissed and disregarded. In the next 90 days, Rose actively participated in several actions, such as Occupy The Ports, with the full support of her family. Still feeling no sense of closure about the initial arrest, they decided that they needed to take further action and filed a complaint with the City of Portland. As a result of this complaint, earlier today [April 15, 2012] Rose participated in mediation with the officers who arrested her . She met with the pair of officers she was handed to after being pulled from the crowd in the following video around the 6:44-8:04 mark. One of the most important questions Rose wanted answered was: why? Why her? She was 17, smaller than the protesters surrounding her, wearing a knitted hat in the shape of a lion, and as you can see from the video, was presenting no threat. Rose’s question initiated a tactical discussion in which she learned that she was arrested because she was in the “bubble”–the area defined by the supervisor standing behind the line of riot police. Anyone located in the bubble was subject to arrest, having supposedly been notified by the infamous “Ice Cream Truck” bearing the sound apparatus calling out a repeated warning to disperse. Rose stated she doesn’t remember hearing the dispersal warning and was suddenly being pushed forward right in the center of the line of scrimmage, in what was reported by officers as a somewhat tense situation. The police also told her that someone had thrown a water bottle or some small item, and that that was what began the series of arrests. Simply put, Rose was arrested because she was there. She was detained for a short time, and asked a very reasonable question as she was being processed. She asked if she would still be able to attend college and one of the officers stated “this is Portland, this will help you get into college!” She was also told that she was “the nicest Occupier” they had ever arrested. On that note, we discussed how her view of the political landscape has changed. She stated that prior to Occupy Portland, she wanted to go to college elsewhere, perhaps the east coast. She really had no thought or involvement in local or national politics. Pam stated that Occupy has caused a moment of enlightenment and a growth process in Rose and it is evident that she both supports and loves this awakening in her daughter. It is apparent to me that Rose began to Occupy as a child, and has emerged a more confident, self possessed and empowered young lady with a very bright future. Through the past months, as Occupy has grown and progressed, Rose has learned that there is a method by which to express her feelings, and that there are solutions to the problems we all face. It has turned her into somewhat of a celebrity in her school, especially with her political science teacher, who looks to her for an opinion whenever Occupy is mentioned. She has gained a fierce sense of community pride and continues to demonstrate a civic consciousness that makes her mother’s eyes light up. Most importantly, she has found her voice and a sense of empowerment that will serve her well as she heads to Portland State University, to perhaps study political science. Editor’s Note: In the run-up to what promises to be a May Day to remember, we are collecting stories from the people who are pouring their soul into making it happen. Are you involved in planning for May Day in your occupation? Have you been to any of the actions building toward the general strike? Tell us about it! You can find a collection of our May Day stories here. NEW YORK, NY–Waiting for fellow Occupiers outside of the courthouse at 100 Centre Street in lower Manhattan, Justin Young explained the role of the OWS Street Medics, also known as the Red and Black Cross, and updated us on how they’re preparing for May Day. Spread the word! Check out these free, downloadable posters. NEW YORK, NY – Unseasonably warm air filled the streets of Manhattan as I climbed the stairs and exited the subway. I approached the intersection of Broadway and Wall Street, glanced to my right and knew I was exactly where I wanted to be. I had found my comrades on the stairs of Federal Hall. Generally, I enjoy taking some time after I first arrive to write, gather my thoughts or maybe even spin a hula hoop for a bit but I was greeted by a familiar face almost instantly. We shared our thoughts with each other until another familiar face began to mic check. A group had been discussing their plan of action for the night and wanted to open that discussion to the rest of us. We openly discussed tactics ranging from breaking out into small groups and sleeping in packs around the financial district to surrounding Liberty Park and sleeping on its perimeter. It’s always so encouraging to be a part of these discussions. Our sense of community grows stronger as the days grow warmer; a true testament to the impending American Spring. Inspiring speeches and playful ways to remember our rights echoed on the human mic following a brief “know your rights” teach-in where we all wrote the NLG [National Lawyers Guild] number on our arms, even though it has been etched in our minds for so long. 212-679-6018. All seemed quiet on the steps when out of the corner of my eye I watched a middle aged woman in a fancy coat and string of pearls drop off a small food donation before hurrying away. I smiled in hope that perhaps the metaphorical walls that separate us were beginning to come down. That optimism quickly changed when around 9pm federal officers climbed the sides of the stairs and formed a line at their peak. It seemed we may have worn out our welcome. I along with many others stood our ground as journalists and livestreamers swarmed to document what seemed to be our imminent doom. Tensions were running high and things could boil over at any moment when in true occupy fashion we broke into inspirational song. What began as the group joining together singing the same tune quickly changed to what I can only describe as a round, each of us singing/chanting something different but all in time with the original beat. The magic of our voices sent shivers up my spine until I heard hateful slurs in the distance attempting to overpower our peaceful message. I looked away from our group to see another middle aged woman, again in fancy clothes. Only this time rather than helping her fellow man she was screaming profanities and flipping us off, looking more like a monster than the lady I’m sure she claims to be. As I scanned the rest of the opposite sidewalk I noticed other obviously disgruntled members of the affluent community. It was clear by the Blue Wall between the two groups, that had grown from about 20 officers to more than 50 seemingly instantaneously, that the powder keg was about to explode. And explode it does as not 100 feet away from me I witness a resident of one of the neighboring buildings assault an occupier. Pushing, hitting, even grabbing and destroying his clearly threatening cardboard sign all while screaming profanities at this peaceful individual who does not fight back. This is the cue the boys in blue need to justify the horrors to come. As the police simply pull the assailant away from his victim, they also use it as an opportunity to swarm in, grabbing people left and right for being on the sidewalk, singling out people doing NOTHING wrong, people trying to organize blankets and signs, slamming them onto the pavement, ripping their arms back and cuffing their wrists with the ever popular zip-ties. The residents continue to stand opposite us, seemingly protected by their Blue Army, chanting, screaming, clapping and laughing as the NYPD spits on the First Amendment in front of them, almost at their command. The visual is sickening and will stay with me for the rest of my life. I turn in response to a tap on my shoulder, it’s my roommate. We embrace on the steps of Federal Hall, glad to see each other safe after the chaos. She is headed home but wanted to make sure I had memorized her number so she could be there for me if I were arrested. Moments like this reaffirm my faith. We are on a good path; we have love in our hearts, always. Short bursts of calm litter the next few hours as we wait for midnight. Still on the stairs we regroup & whisper songs and thoughts of hope to one another but when anyone attempts to amplify their voice above speaking volume they are immediately a target for arrest and mobbed by “white shirts” for speaking their mind, for daring to have a voice. The police climb the stairs of Federal Hall, in the shadow of George Washington and remove occupiers by force. I spent the next few hours consoling a friend whose brother was arrested. The three of us had been chatting earlier and I had tried to calm him then, warning her to keep a watchful eye on him. Sometimes no matter what we do, these situations cannot be avoided. We embraced as she wept on my shoulder. Wishing I could offer her more, knowing this was all she needed. Someone to listen, lighten the load, share her pain. We were all in pain. I said my farewells around 5am, recording another sleepless night in the books for a good cause, knowing I would be back shortly. Oddly, as I walked back to the subway some 12 hours later the air felt warmer that it had in almost seven months and not from the spring sun beginning to fill lower Manhattan but from the love and loss we all shared on those steps. CHICAGO, IL – As the Chicago Police Department closed in on those who had barricaded themselves inside Woodlawn Mental Health Clinic last Thursday, I realized this was a terrible time for me to be going away from Internet access for the next 48 hours. If you aren’t up to speed, here’s the situation. Under Mayor Rahm Emanuel’s budget, 6 of the 12 public mental health clinics in Chicago are scheduled to be shut down. Adding insult to injury is the fact that the clinics slated for closure are uniformly located within the poorest, hardest-hit neighborhoods of the city. In other words, those who need it most will no longer have access to mental health services. The Mental Health Movement associated with STOP Chicago has been working for the past 4 years to protect mental health clinics from closures and privatization. When Emanuel’s budget was about to pass, they staged a 10-hour sit in outside the mayor’s office that Occupy Chicago joined in solidarity. With the Woodlawn Clinic set to close on April 30th, however, it was time for drastic action. Last Thursday night, doctors, patients, activists and Occupiers barricaded themselves inside the clinic while others supported the occupation from outside. Shortly after midnight, CPD cut their way into the building with chainsaws, arresting 23 people. When I returned to the land of Internet connections on Saturday, it was to the welcome news that the clinic had been re-occupied with a small tent city established on an empty lot across the street. Eviction seemed imminent but they held through that night and the next, despite severe wind and thunderstorms. After work on Sunday I was able to join the occupation for several hours in the afternoon and evening. Before heading out, I blindly tweeted an offer to drive any interested northsiders down to participate in the occupation. I got one reply, a political science and sociology student from Northwestern University named Isa–formerly a stranger, now a friend and first-time Occupier. People at the encampment also tweeted me with supplies needed, which I was able to deliver. And, naturally, I brought homemade cookies–because it’s not a revolution until somebody bakes cookies. If I didn’t know better, my first impression would not have been that this was the site of an embattled protest. As we approached the camp we saw people sitting together–talking, laughing, and sharing a bite to eat. A long table was overflowing with food donated throughout the day and a makeshift grill gave off the scent of fresh barbecue. Music played, people danced. It had all the makings of a great block party–plus, of course, some large protest banners and a few police vehicles idling nearby. I introduced myself by my Twitter handle and joined the group in discussions of philosophy, recaps of the arrests, and just plain socializing. One Occupier said (and I’m afraid my memory is not good enough for this to be an exact quote): “I don’t care if they arrest me. My friends will bring me books to read, and when I come out I’ll have even more knowledge and power.” It began to rain; everyone rushed to cover the food table with tarps. The cafe on the corner has been more than kind about letting us use wall sockets and bathroom facilities during business hours. A small group of us were recharging ourselves and our various electronic devices when I noticed an Occupier, one of the 23 arrestees, talking to a Chicago police officer. It’s a conversation I wish could be duplicated with every police officer in the city. She explained why we were out there protesting and how the closure of public mental health clinics would affect him directly, as he would be encountering untreated mental health patients out in the streets. He listened attentively and seemed to understand what was at stake–but told her the order to arrest came from above. This occupation is the work of the Mental Health Movement and STOP Chicago–we at Occupy Chicago are joining in solidarity. As such, the core Occupy Chicago members whom I’ve gotten to know over the past several months were interspersed with other activists and those whom use the clinic and know firsthand how devastating it will be to lose it. It was humbling and inspiring to be amongst both those who have worked so hard to keep the clinics open and those who will be directly affected by the loss of this community resource. The evening concluded with a meeting to discuss next steps and possible uses of the occupied space. We haven’t held a space for over 24 hours in Chicago until now, and the possibilities are exciting. It’s in a community where we haven’t held any actions or done much outreach, but now we’re out in the open, talking to the neighbors and spreading the word. All of that gives me a great deal of hope that we can change hearts and minds by reaching out to those who need our help the most. Update: As I was writing the final paragraph about being hopeful for the future of this occupied space, the encampment was surrounded by squad cars and threatened with mass arrest. After dismantling the tents, the police left without making any arrests. Many stayed overnight anyway, sleeping in cars or staying on the sidewalk. UPDATE (April 17th 5:35pm): Woodlawn was briefly re-occupied this afternoon just after 2pm. CPD moved in almost immediately, demolishing tents and destroying personal property. 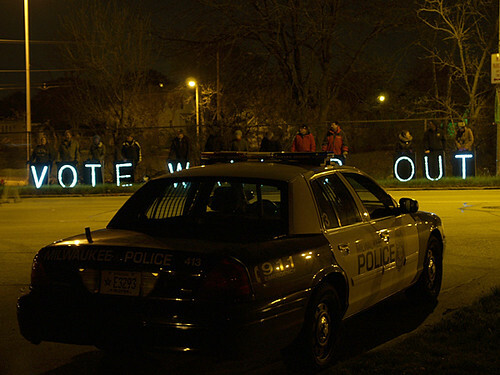 Two Occupy Chicago participants standing on public sidewalks were arrested, including press liaison Rachael Perrota. The story was originally published at The Daily Kos. When cars and trucks pass underneath our glowing signs, the drivers and passengers retain a memory of the message, distributing it to both nearby and far-flung locations. We hold the letters one-side-by-each, short-form messages of protest against long-form extremism, semaphores of solidarity picked up and swept across social media. This is the OLB, “coming soon to an overpass near you,” a group dedicated to tactics of visibility and voice, the importance of physical witness, community coherence and the power of purposeful play. Last evening even the 80% prediction of rain broke in our favor. The 20% chance of no-rain won the early evening. It was odd being out and not feeling bone-cold. 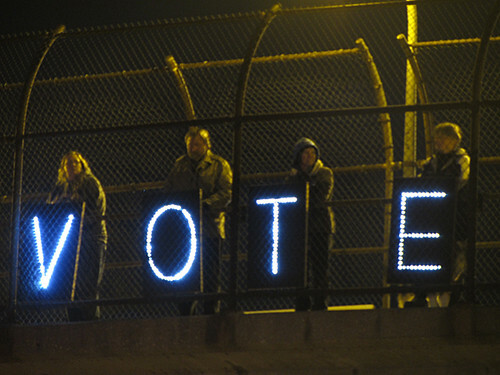 We had scoped out a pedestrian overpass we had never occupied before, a long arcing structure built over an extremely wide section of Milwaukee’s I-43, a bridge from East to West within an African American neighborhood of Milwaukee. These often overlooked structures are like fords in roaring rivers, stitching two banks of bisected communities back together. 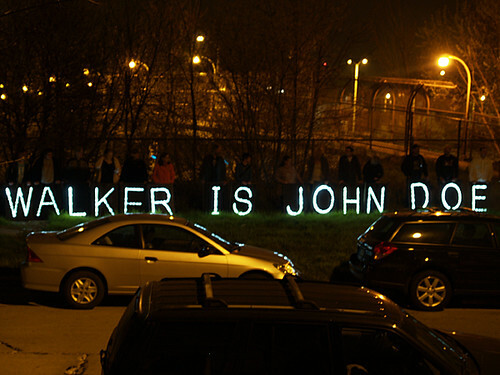 More than twenty people showed up, so we were able to bring out multiple messages. 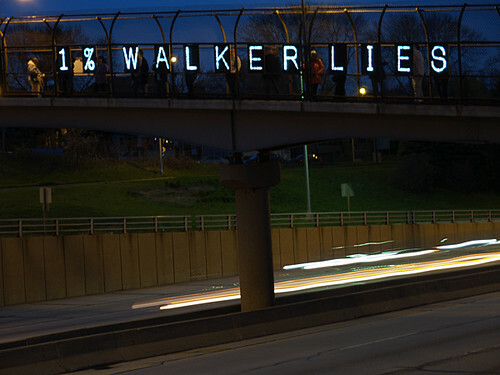 “WALKER LIES” was newly possible because of the addition of a nice “S” to our lexicon, and as more people arrived we later spelled out “WALKER IS JOHN DOE,” referring to the ongoing investigation into campaign corruption that has enmeshed Walker and his closest Milwaukee County cronies. 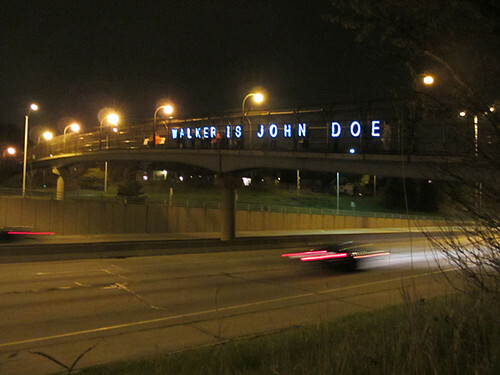 It is good to keep this reminder floating over the freeways. Our hope is that people either say “Oh, yeah… that issue is still out there!” or “Can you tell me what that whole JOHN DOE thing is all about?” Our first message of the night was pretty self-evident if you are paying attention. His lips move: he’s usually lying. In order to get the beautiful photographs, I need to get down to highway level with my camera on tripod. The big gap in the fencing made this easy, and two of us were down taking pictures when the police came. Ugh-oh. 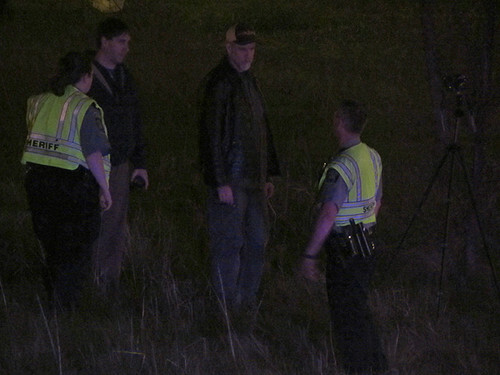 Two squad cars pulled over, disco balls blazing and two Milwaukee County Sheriffs climbed the embankment towards us. They were fairly surly. I stood patiently waiting, taking pictures while I could, wondering what was coming next. I heard the lead cop in his walkie-talkie, “kkkssssshhh, yeah, we’ve got a bunch of protestors at the bridge….. kkksssshhh…Trespassing on right of way…. kkkssshhhhh…. Complaints called in….” Complaints, I now understand, are called in whenever we come out. The frequency of police presence is dramatically rising in proportion to the increase in our national visibility. 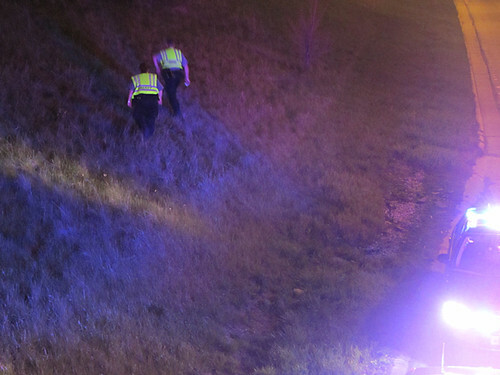 When the Milwaukee Police came last Wednesday out near State Fair Park on I-43, the first squad car parked and just watched. It was a little disconcerting. We were coming off the bridge to end our action, and figured it would be fun to line up the signs against the fence right in front of the squad, in order to make a unique display for the officer. Once thusly arrayed, I went up to the cruiser. The officer rolled down her window, and I said to her, “I’m sorry, are we causing a problem for you?” (which I think is more effective than “Are we doing anything wrong?”). We both laughed because I caught her with her cell phone out, taking pictures of the signs. She was going to post them on Facebook. She couldn’t share her political feelings with me, but she was really nice and really friendly. A few minutes later when the paddy-wagon came ready to check us out or roll us in, she was already on our side. 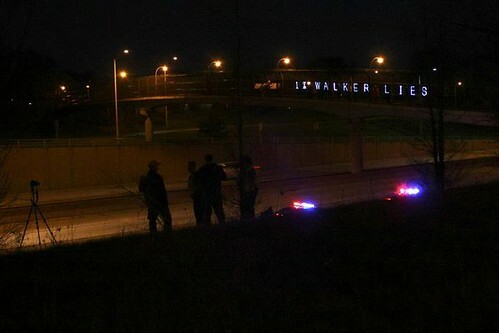 The officers talked among themselves for a while, looked at our signs, looked at our motley crew of kids and elders and everyone in between, all down-home Wisconsinites. After a while they said goodnight and left. It was all pretty gentle, yet their presence was, of course, a large part of the communication. Last night, our encounter with the law was a lot less friendly. Everything was fine, but it was pretty terse and tense. OLB gently yet insistently pushes at the constraints around public assembly and peaceful protest. We are not there to argue with cops. We are there simply to be there, and to be visible. The message seems to be getting out. After being featured in the Sunday NYTs two weeks ago, our Facebook “reach” shot to 69,503 people, far-flung across 20 different countries. (Please “Like” our page here.) Care2 did a nice article about us this morning. 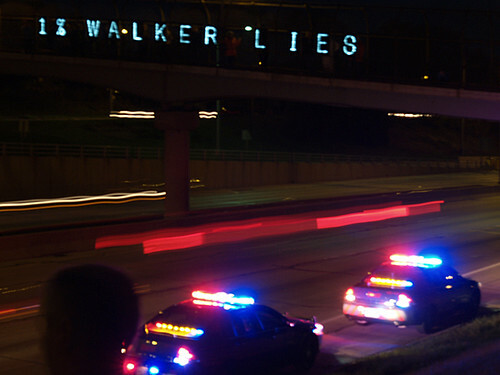 We’re talking with a number of other protest groups around the country about possible splinter-group collaborations, and we are booked to appear throughout the state at events and overpasses. A lot is happening, and we try to balance it with other pressing duties of job and family. It is that easy. Build bridges with diverse communities. Take the overpass as metaphor and arc yourself across bisecting structures. We can do this. It will take time, but through action and creativity and play we can model the same new and old solutions that are always within reach.